This paper presents the results of the second phase of an ongoing investigation into the behaviour of cavity masonry walls constructed with concrete block, brick veneer and shear connectors. In the first phase, a test program has been conducted on tall cavity walls under eccentric axial forces. In this phase a nonlinear finite element analysis model is developed to simulate the database of existing test results. The model represents all components of the cavity wall, the reinforced concrete block back-up wythe, the brick veneer and the shear connectors. 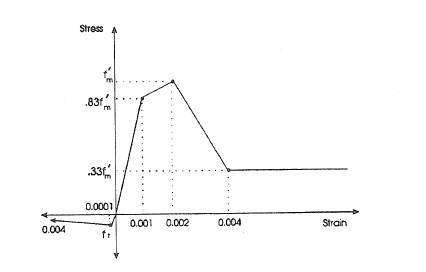 It accounts for the nonlinear material behaviour of all components as well as the large rotation small strain characteristics of the deformation. The numerical analysis results are successfully compared with a number of test results. THe simulation offers insight into the mode of failure, in particular for walls with high eccentricity rations.